The following article is based on two talks given by D. Eldridge, one to the Meigs Memorial Association, and the other to the Hyde Park Historical Society, both in 1906, and then published as an article in volume VI of the Hyde Park Historical Record, 1908. The article below includes an edited extract from, History of the Fifty-fourth Regiment of Massachusetts Volunteer Infrantry 1863-1865 by Luis F. Emilio (1894). Emilio was initially appointed as the second lieutenant in the 54th eventually gaining rank as its captain. A terrible time, and what do you think? They’ve found a new way to get something to drink. Mr. Ebenezer Paul, living near Paul’s Bridge, owned the land. It is related that the first that Ebenezer Paul knew of any designs upon his land as a camping ground, was his sudden discovery one morn of two or three men sitting under one of the long rows of elms, a few of which are now standing, and his cows gazing upon them with interest. Later, it is said, they came and took the land, leaving him to apply to the State for compensation, which he did, and I am credibly informed that he received three hundred dollars per year rental. The first call for troops — insignificantly small as it proved — was succeeded in May, 1861, by a second, this time for 500,000, and it was under this call that the first troops assembled “On Sprague’s Plain near Sprague’s Pond in the town of Dedham.” Quoting the language of the order of Governor Andrew dated July 2, 1861. The first to arrive upon these grounds, — and they came within a few days after the 4th of July, 1861, — were the 18th and 20th Regiments, the latter commanded by Col. William Raymond Lee, who is credited with having selected the spot. The ground over which we now are was covered by the tents of the 20th, while a little farther away from Milton Street, near the Elms, the 18th pitched its tents. 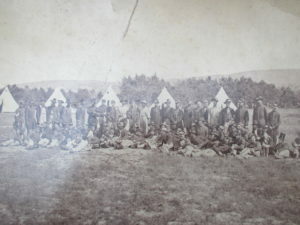 In connection with the accounts of the 18th Regiment, the press announced that the camp would be called Camp Brigham, and the 20th named it Camp Massasoit. This shows that each regiment adopted a name for its own camp, and this method continued for awhile, until the general name of Camp Meigs was placed upon the whole. About the middle of August it was announced that the 20th Regiment had about 500 men and the 18th Regiment 641. On the 19th of October, a newspaper said that stables had been completed for 600 horses, the rest will be completed this week, and that the camp was near low, marshy ground. The Cavalry Regiment numbered 1,029 early in December, and they had about 900 horses. The cold was such that small stoves were issued, for use in the tents, which were of the Sibley pattern (conical). All had departed for the battlefront by the end of 1861. Our camp at Readville remains vacant, silent and solemn until August, when under the call of 2d of July for 300,000, we find at Readville the 9th and nth Batteries and the 42d, 43d, 44th and 45th Regiments. 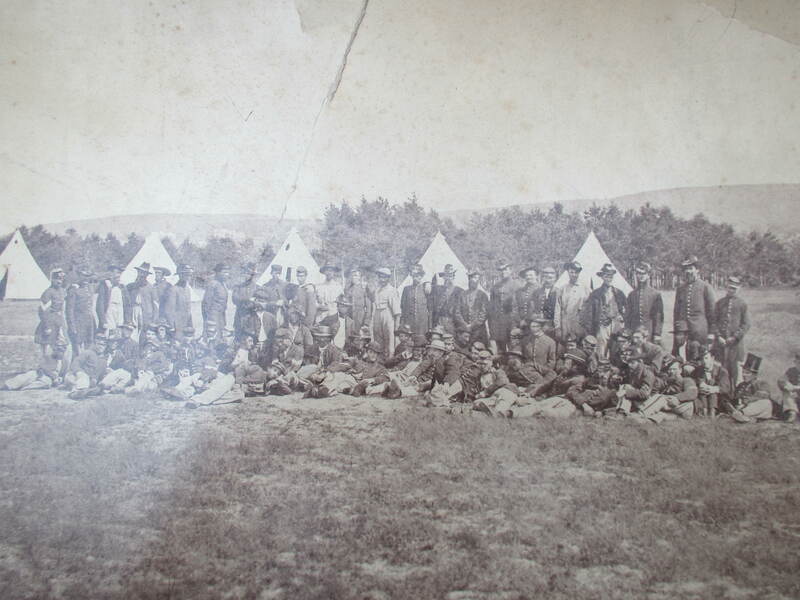 Colonel Codman’s 45th regiment at Camp Meigs, July 7, 1863. On the 8th of September, 1862, I find the first mention of ” Camp Meigs,” and in connection with the fact of the arrival at Readville of a company from Dedham. Camp Meigs 1861-1865. 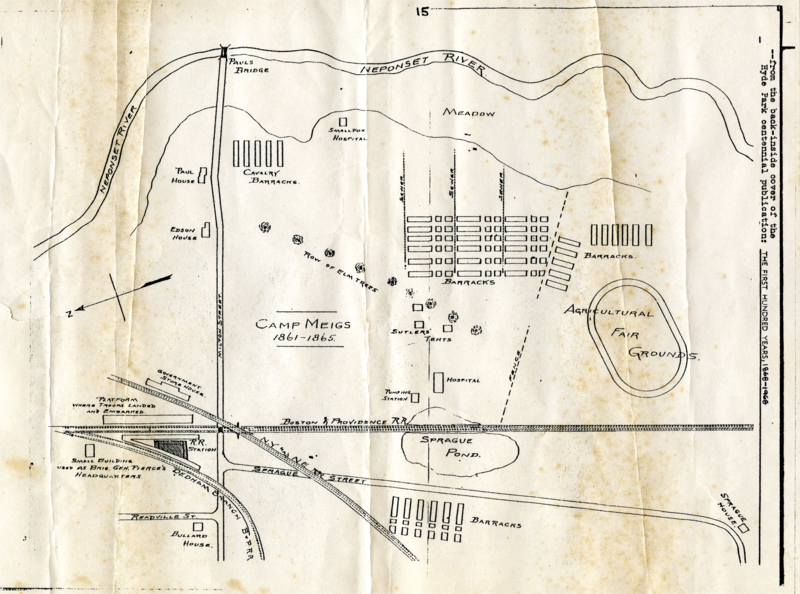 Sketch showing relative position of the camp over time. The 54th Regiment had begun to form. This regiment was the first colored regiment organized in a northern state. Gov. 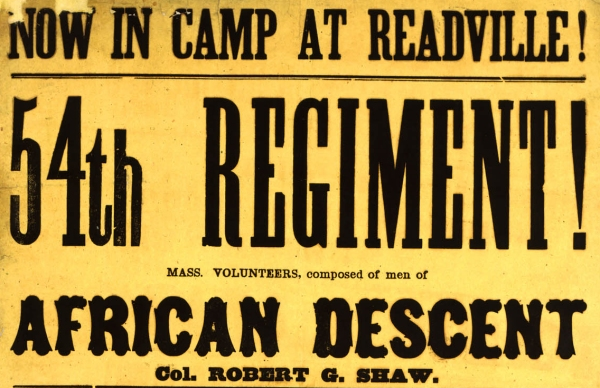 Andrew received his authority to organize colored regiments in January, 1863, and apparently the first to arrive at Readville came on February 21st, and the twenty-seven men were assigned to the barracks first occupied by the 44th. This regiment had a unique experience. The twenty-seven men on the 21st of February had increased to 324 by the 21st of March and the regiment was filled and left Readville on the 28th of May, being sent to the Department of the South to operate against Charleston. Robert G. Shaw, who was made its colonel, was, with other young officers, chosen because of their firm anti-slavery principles, ambition, superiority to a vulgar contempt for color, and because of their military experience. The presentation of the flags, by Governor Andrew, on the 18th of May, was peculiarly impressive, the Governor taking occasion to speak at length, and the occasion was otherwise marked. The regiment went to the Department of the South, in which department I was serving. They had been in the department but a short time when they were called to battle upon James Island, and following this, were suddenly called to Morris Island, and engaged on the evening of the 18th of July, 1863, in that memorable assault upon Fort Wagner. This regiment was placed in the forefront. My own regiment, the 3d New Hampshire, was also a part of the assaulting column. In the thick of the fight Colonel Shaw was killed, and next day buried in a trench, with the men whom he had led to their death. The beautiful monument upon Boston Common, opposite the State House, will testify to all generations to the valor of Colonel Shaw and his regiment. A school was established shortly after the close of the war, in Charleston, S. C, for colored children, in his honor, and named the Shaw Memorial School, and the city of Boston has also named one of its schools in the West Roxbury District in his honor. And thus the name and fame of Col. Robert G. Shaw are properly and appropriately perpetuated. Here now is an edited extract from History of the Fifty-fourth Regiment of Massachusetts (Volunteer Infrantry 1863-1865 by Luis F. Emilio (1894), providing backbround and detail on the 54th’s time at Camp Meigs. President Lincoln, on Jan. 1, 1863, issued the Emancipation Proclamation. In September, 1862, General Butler had begun organizing the Louisiana Native Guards from free negroes. General Saxton, in the Department of the South, formed the First South Carolina from contrabands in October of the same year. Col. James Williams, in the summer of 1862, recruited the First Kansas Colored. After these regiments next came, in order of organization, the Fifty fourth Massachusetts, which was the first raised in the Northern States east of the Mississippi River. Thence forward the recruiting of colored troops, North and South, was rapidly pushed. As a result of the measure, 167 organizations of all arms, embracing 186,097 enlisted men of African descent, were mustered into the United States service. Lieutenant E. N. Hallowell, on Feb. 21, 1863, was ordered to Readville, Mass., where, at Camp Meigs, by direction of Brig. Gen. R. A. Peirce, commandant of camps, he took possession with twenty seven men for the new regiment. Readville is on the Boston and Providence Railroad, a few miles from Boston. The ground was flat, and well adapted for drilling, but in wet weather was muddy, and in the winter season bleak and cheerless. The barracks were great barn-like structures of wood with sleeping-bunks on either side. The field, staff, and company officers were quartered in smaller buildings. In other barracks near by was the larger part of the Second Massachusetts Cavalry, under Col. Charles R. Lowell, Jr. , a brother-in-law of Colonel Shaw. During the first week seventy two recruits were received in camp, and others soon began to arrive with a steady and increasing flow ; singly, in squads, and even in detachments from the several agencies established throughout the country. Companies A and B were filled by March 15 ; Company D was then formed ; Company C came to camp from New Bedford on March 10. These four companies were mustered into the United States service on March 30. Lieutenant Partridge on March 28 was assigned to begin Company E; Lieutenant Bridge, reporting from recruiting service, was placed in command of Company P, just forming; Lieutenant Smith, on April 10, was chosen to organize Company G. As recruits came in during April at the rate of one hundred per week, these three companies were ready for muster on April 23. Companies H, I, and K were mustered May 13, completing the regiment. ” From the outset, the regiment showed great interest in drilling, and on guard duty it was always vigilant and active. The barracks, cook-houses, and kitchens far surpassed in cleanliness any I have ever witnessed, and were models of neatness and good order. The cooks, however, had many of them been in similar employment in other places, and had therefore brought some skill to the present responsibility. Owing to heavy and frequent rains in March and the early days of April, the mud was often very deep between the barracks and officers’ quarters, requiring much labor to clean paths. During cold weather the quarters were kept warm by wood fires. In stormy weather squad and company drills went on in vacant barracks. Later in the season the companies under commissioned officers were taken several times each week to bathe in a pond near by to insure personal’ cleanliness. The first dress parade took place on April 3, when four companies were in line. Every day, but especially on Sundays, large numbers of visitors were present. Many ladies graced the camp with heir presence. People came from distant places to witness the novel sight of colored soldiers in quarters and on the drill ground. For the purpose of securing familiarity with drill and tactics, and to obtain uniformity in the unwritten customs of the service, an officers’ school was begun April 20, at headquarters, and held frequent sessions thereafter, until the regiment departed for field service. There were a few deaths and a moderate amount of sickness while at Readville, mainly from pneumonia and bronchitis, as the men were first exposed in the trying months of February and March. Now and then the monotony of camp life was broken by some noteworthy event. On April 21, a visit was received from the “Ladies’ Committee.” Mrs. Governor Andrew, Mrs. W. B. Rogers, Mrs. B. D. Cheney, Mrs. C. M. Severance, Miss Abby May, Judge Russell, Rev. Mr. Grimes, Charles W. Slack, and J. H. Stephenson were of the party. Another event was the review by Governor Andrew and Secretary Chase in the afternoon of April 30, the President’s Fast Day. The line was formed with eight hundred and fifty men ; and the distinguished visitors were received with due honors. Dr. Howe, Robert Dale Owen, Mr. Garrison, and other gentlemen were also present. On April 30, the regiment drew nine hundred and fifty Enfield rifled muskets and a suitable number of noncommissioned officers’ swords. Lieutenant Jewett, appointed ordnance officer, issued the arms on the following day. May 2, the regiment was drilled for the first time in the School of the Battalion. General Peirce, accompanied by Surgeon-General Dale and the. Governor’s Council, reviewed the Fifty-fourth on May 4. Brig. -Gen.
By May 11, more recruits had arrived than were required, and the Fifty-fifth Massachusetts was begun with the surplus on the succeeding day. They occupied the old cavalry camp. Friends had procured flags, and it was determined to make the occasion of their presentation, on May 18, a memorable one. The day was fine and cloudless. Very early, friends of the command began to arrive in private carriages, and by the extra trains run to Readville. Many prominent persons were present, including Surgeon General Dale,- Hon. Thomas Russell, Professor Agassiz, Prof. William B. Rogers, Hon. Josiah Quincy, George S. Hale, William Lloyd Garrison, Wendell Phillips, Samuel May, Rev. Dr. Neale, Frederick Douglass, and many others. The parade was thronged with white and colored people of both sexes, to the number of over a thousand. Line was formed at eleven o’clock, and the regiment was broken into square by Colonel Shaw. Governor Andrew, with his military staff in full uniform, took position inside the square. Brilliant in color and of the finest texture, fluttering in the fresh breeze blowing, the flags destined for the regiment were ready for presentation. They were four in number, — a national flag, a State color, an emblematic banner of white silk with the figure of the Goddess of Liberty, and the motto, ” Liberty, Loyalty, and Unity,” and another with a cross upon a blue field, and the motto, In Soc Signo Vinces. By invitation, the Rev. Mr. Grimes offered an appropriate prayer. Governor Andrew then stepped forward; and the flow of eloquent words delivered with the earnestness which characterized him, heightened by the occasion, will never be forgotten by those that heard his voice. May 28, at 6.30 a. m., the regiment formed line for the last time at Readville, and marching to the railroad station, embarked on cars, arriving at Boston about nine o’clock. As the companies filed into the street from the station, the command was received with cheers from a large gathering. One hundred policemen, under the chief. Colonel Kurtz, were present, to clear the streets. Unknown to the general public, reserves of police were held in readiness, under cover, to repress any riotous proceedings. Preceded by Gilmore’s band, the line of march was taken up through Pleasant, Boylston, Essex, Chauncy, Summer, High, Federal, Franklin, Washington, School, and Tremont streets, Pemberton Square, Somerset and Beacon streets to the State House. All along the route the sidewalks, windows, and balconies were thronged with spectators, and the appearance of the regiment caused repeated, cheers and waving of flags and handkerchiefs. The national colors were displayed everywhere. Passing the house of Wendell Phillips, on Essex Street, William Lloyd Garrison was seen standing on the balcony, his hand resting on the head of a bust of John Brown. Only hearty greetings were encountered; not ail insulting word was heard, or an unkind remark made. Halting at the State House, Governor Andrew, his staff, and many distinguished gentlemen were received with due honor, and thence escorted along Beacon Street to the Common, which was entered by the Charles Street gateway. This historic parade-ground was crowded with spectators. On the 4th of February there were nearly 4,000 men in Camp Meigs, and on that day General Burnside reviewed them, accompanied by Governor Andrew and General Devens, each with his staff. A special train brought the reviewing party, arriving about 2 p. m. Jones’ Battery fired a salute of thirteen guns. The position of the troops was as follows: 4th Cavalry, 1st Cavalry, Milton street; 59th Regiment, nth Battery, near barracks; 56th regiment, 13th Heavy Artillery, near barracks; 5th Cavalry, 58th regiment, west of railroad. Total 3,879. The story of the hospital. In June, 1864, the barracks at Readville were ordered to be turned over to the Medical Department for conversion into a hospital. The barracks being in two groups, one east of the Providence Railroad, and the other west of it, I assumed that General Pierce exercised his judgment as to the scope of the order, and turned over to the medical department only those upon the east side of the railroad, consisting of quarters for two full regiments, i.e., twenty barracks. There were forty barracks as well as other buildings ready for conversion into a hospital. It shows that the cook-houses and officers’ quarters were placed at the ends of the barracks, and thus forming porches, one at either end of the forty barrack. As to the work and capacity of the hospital, I find that on the 13th of December, 1864, there were 498 sick and 498 wounded, a total of 996. Early in May, 1865,there were 478 patients, cared for by 78 attendants, and on the 3d of June, 1865, there were 376 patients. All the accessories, whether of material, of buildings, or of medical officers, were supplied to make this a first class hospital, which finally embraced a library, gymnasium and chapel. Of the many operations at this hospital, one requiring more skill than perhaps any other was that performed upon Private Paran C. Young, Company B, 3d Massachusetts Cavalry and now living in Provincetown, Mass. He had been severely wounded in the neck at Cedar Creek. He arrived at Readville, January 2d, 1865, and was at once reported upon the dangerous list. Four days later Dr. Langmaid performed tracheotomy upon him; and at a moment when he was presumed by the attendants to be dead, Dr. Langmaid knew better, and the result was that the man was almost literally snatched from the grave. A silver tube was inserted, and in all these years Comrade Young has breathed through it, and when he speaks, a hand is pressed in the proper place to permit speech. On July 1st, 1865, it was ordered, the war having ended, that the hospital be discontinued, and the patients transferred to the Dale General Hospital at Worcester, and these orders were carried out with very little delay. 1884. January 1. Deed Francis Bryant to Readville Homstead Association 1,665 feet. 1890. Hamilton Park Association organized. 1894. Changed to Meigs Memorial Association. 1897. May 30. Flag pole and guns dedicated, Post 121 G. A. R, officiating. 1903. January 4. Name of Hamilton Park changed to Meigs Memorial Park. Let me say that Hyde Park may well be proud of its delightful suburb, proud that so historic a spot is an integral part of the town. Proud may the dwellers at Readville be, for here, beneath our very feet, nearly fifty years ago, thousands marched up and down and upon this plain. The rattle of musketry, the bugle’s blast, the rat-a-tat-tat of the drum, the clanking of the sabre, the neighing steed and the roar of cannon became familiar sounds. Here the very flower of the youth of this good old Commonwealth of ours gathered themselves together as a mighty phalanx. Here they learned the art of war, bade fond mother and father, or wife, the sad good bye and marched away. Thousands never came back; other thousands perished upon the battle-field, or in the hospital or the dreadful southern prison. Yet other thousands of the wounded and the sick were sent here to the hospital that they might be near to those they loved and that they might be tenderly nursed.